Tarzan is the latest iconic literary property get a big budget reboot with David Yates directing Alexander Skarsgård in the title role of The Legend of Tarzan. Edgar Rice Burroughs' classic hero gets part origins treatment and part new adventure in this narrative from Adam Cozad and Craig Brewer which plays out like a lavish colonial potboiler. Tarzan (Skarsgård) is called from London to the Belgian Congo as part of a ploy from corrupt emissary, Leon Rom (Christoph Waltz), a greedy colonialist exploiting the African landscape and enslaving its people. After Tarzan's wife Jane (Margot Robbie) is kidnapped by Rom, he and American gunslinger George Washington Williams (Samuel L. Jackson) must stop the Belgian's corrupt scheme. With twenty-something Burroughs' texts, around two hundred film appearances and countless authorised literary follow-ups, the Tarzan legacy is quite an impressive one - albeit one that has fallen generally from public consciousness. Therefore, the big budget Hollywood update is something that makes sense and under David Yates' steady direction, a starry cast and a straight forward action-adventure narrative The Legnd of Tarzan is an undeniably safe and entertaining watch - despite falling to some of the pitfalls of the 21st century blockbuster. Cozad and Brewer successfully opt for a new narrative angle, whilst drip feeding elements of Tarzan's widely-known origins into the fold, meaning the pace of this new adventure begins somewhat fresh and fast-paced. However, these writers provide a Tarzan tale from a contemporary perspective, attempting to capture the pitfalls of colonialism and craft some form of moral heavy-heartedness. The result can be somewhat condescending in tone (e.g. shots of crowds of cheering natives on cliffs) and feels less effective than simply embracing Burroughs' tales for the rip-roaring colonial romps that they are - and that's perhaps why Christoph Waltz's character shines here, because he has no moral compass - he's motivated by relatable human desires of wealth and power. He feels fitting of the period. Outwith this moral slant, Yates and the screenwriters have managed to craft a modestly-entertaining yarn that shines when turning a blind eye to contemporary political sensibility. The core tale of Tarzan hunting down Rom across the lavish Congo landscape makes for an experience of aesthetic might and narrative excitement. Yates directs the action with a slick, albeit somewhat too CGI-enhanced eye, yet manages to craft bold and engaging set-pieces like jungle chases and colonial battle scenes. Whilst, surrounded by well-cast supporting players which certainly aids the experience, Skarsgård is unfortunately miscast. Tarzan's dialogue is unclear and we are never fully convinced by the dichotomy between refined John Clayton III and vine-swinging, chest beating Tarzan. Fortunately, Robbie adds a gutsy charm to Jane, whilst Samuel L. Jackson's fast-talking George Washington WIlliams may feel anachronistic but is nonetheless a light-hearted relief (especially when seeing the actor yelling and firing a Gatling gun). 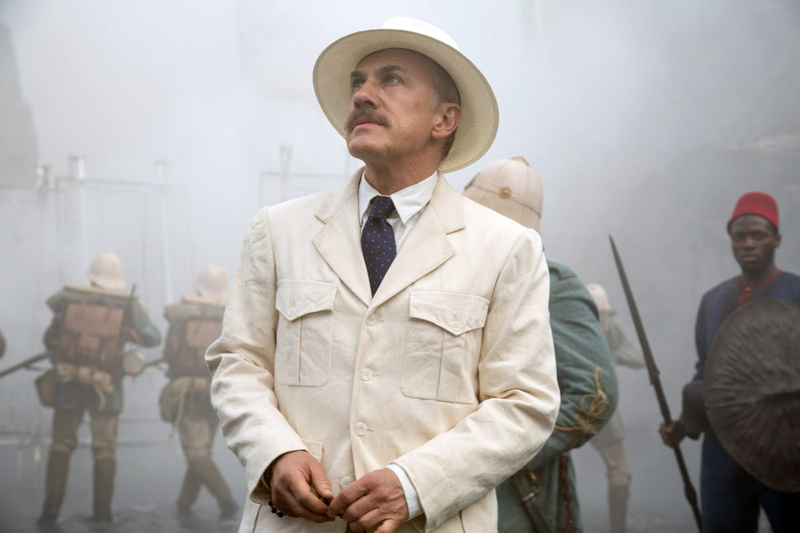 However, this is Waltz's show and the actor is entrancing as sneering white safari suited, panama hat wearing colonialist Rom. This scenery-chewing turn feels like a perfect match for the potboiling quality of Burroughs' yarns. The Legend of Tarzan is an entertaining romp with lavish, polished visuals and fun supporting turns, its condescending moral compass and Skarsgård's performance prove disappointing, however.